The 24 Hours Of LeMons Arse Freeze-A-Palooza had chills and spills, with an all-time high number of entries on the track. Here's the complete roster of participants, ranked by lap totals. We had some seriously crazy results this time around, with my Index Of Effluency predictions way, waaaay off the mark. In fact, three of the top five finishers were IOE contenders, and one of them took the checkered flag! 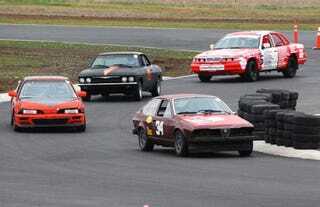 Not only that, a TR7, an XJ-s, and an X1/9 each managed to finish more than 250 laps. This race featured the traditional LeMons themes of BMW electrical system malfunctions, connecting rods clanking onto the asphalt, and teams outraged by penalties they totally didn't deserve, plus more than the usual number of upside-down cars. Lap bonuses and penalties assessed during the BS Inspection process played a major role; 98th-place Krider Racing actually racked up the highest number of laps, for example. I'll go into more detail when it's time for the Arse Freeze-A-Palooza Über Gällery, but today it's time to provide fodder for endless bench-racing arguments. You can see the complete results here. Guess The Thunderhill LeMons Effluency Contenders&apos; Lap Totals, Win Fabulous Prizes!